The land fronting Reef Street, River Road, and Young Street – now Memorial Park was once the location of the Union and Ferguson Sawmill. The Memorial Laneway situated off Mary Street was originally the entrance to the sawmill. The disastrous flood of 1893 swept away the sawmill. Rebuilding again was damaged by flood waters during the early 1900’s forced the mill to close. March 25, 1919 the Henderson family owners of the land, donated the property to the people of Gympie. A public meeting was held at the Town Hall in January 1919 by the Mayor of Gympie, Alderman Stitt. It was decided a memorial to be erected to commemorate the fallen of the Boer War and World War One. The Memorial was constructed by Mr. A.L Petrie of Toowong, Brisbane in 1920. 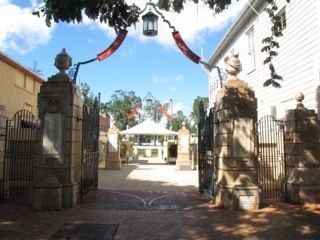 During his visit to Gympie in 1920, the Prince of Wales visited the newly constructed Memorial Gates. It would be hard to imagine looking down the Memorial Laneway from Mary Street today and the same view 100 years ago, one would be looking down a dusty track to the sawmill. A huge redevelopment took place during the 1995 ‘Australia Remembers’ campaign. During that time replica memorial pillars were also erected in the Memorial Laneway, listing the names of those who paid the supreme sacrifice during World War Two and Vietnam. Sadly, other names have been added since then. In 2001, the first of eight murals was unveiled. The other murals were placed on the walls each side of the Laneway and the last mural was completed and unveiled on 26 January, 2009. Each mural tells their own story, conflicts Australia has been involved in.